Business purposes include driving from your place of employment to another work site, to meet with clients, or to go to a business meeting. Driving from your home to your workplace doesn't count as a business purpose – the Internal Revenue Service says this is commuting and that's a personal expense. But if you maintain an office in your home, traveling from your home office to meet with a client or to conduct business is tax deductible. 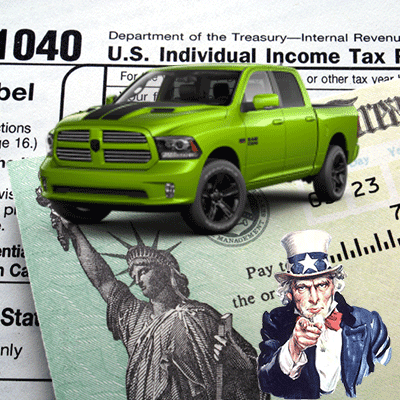 The deduction for business use of a vehicle is taken on Schedule C if you're self-employed, on Schedule F if you're a farmer, or as an itemized deduction as part of your unreimbursed business expenses on Form 2106 if you're an employee. Medical purposes involve driving to obtain medical care for yourself or for your dependents. The drive must be "primarily for, and essential to, medical care," according to the IRS. The deduction is taken on Schedule A as part of your itemized medical expenses. The cost of driving your car to move to a new residence may be deductible as part of the moving expense deduction if you must relocate for work-related reasons and your new place of employment is at least 50 miles farther from your old home than the distance between your old home and your old job. You must also work for your new employer for at least 39 weeks during the 12 months immediately following your move. This deduction is taken on Form 3903. You can deduct car expenses if you use your car when you're providing services to a charitable organization. Driving to perform volunteer services for a church, charity or hospital would be deductible. This deduction is taken on your Schedule A as part of your charitable donations. Some other different car expenses are deductible depending on the purpose of the drive. For example, you cannot claim interest, depreciation, insurance or repairs if you're driving for charity or medical reasons. Because expenses related to personal use or commuting are not deductible, you must calculate the percentage of your overall miles that you drove for a tax-deductible reason. If your overall miles were 18,000 and 9,000 – or half – of those were for business purposes, you can claim a deduction for 50 percent of the above costs. Your other option is to use the standard mileage rate to figure your deduction. The rate varies depending on why you're driving and are hinged to inflation, so they can go up or down by year. Simply multiply the applicable rate by the number of miles you drove to determine the dollar amount you of your deduction. Taxpayers can also deduct parking fees and tolls in addition to the standard mileage rate, but no other actual expenses. Which is Better – Actual Expenses or the Standard Mileage Rate? Use whichever method results in the larger deduction. This can vary from person to person depending on how many miles you drive, the amount of depreciation you're claiming, and all the other expense variables. Crunch the numbers both ways and figure out which will be best for your tax situation. Claiming the standard mileage rate generally results in less paperwork and is best suited for situations in which you drive your car sometimes for work, charity or medical appointments. It also saves you from having to dig up all your car-related expense receipts and tallying them up at tax time. If you opt for using the standard mileage rate, however, you must choose that method in the first year you use your car for business purposes. If you begin by claiming actual expenses, you'll be stuck with that method for as long as the vehicle is being used for business. It's a good idea to keep a mileage log in case you're ever called upon to prove you're eligible to deduct your car and truck expenses. Enter the date of each tax deductible trip you make, showing how many miles you drove and for what purpose. You'll also need to know the total number of miles you drove for the year so it's a good idea to indicate your odometer reading at the first of each year. You'll also need to keep track of your vehicle expenses. An easy way to keep track of these expenses is to use a personal finance program. This will make it easier at tax time to generate a report of your total car expenses for the year. If you have any question on how you can use you Tax Refund as a down payment for a new used car at Del Toro Auto Sales, please contact us calling 888 324 2978 or visit our website for used cars for sales or to apply for credit. Hey! I have read all your Blog this So Nice and Awesome service you have provided, I learn many new things from here and want implement my website. If you are also Know for something New related to Irs Receipts then visit my website.